I drove out to Brattleboro, Vermont on a rainy day with wonderful vistas of the changing foliage along the way. I was excited to be finally visiting the Tasha Tudor Museum. As you may recall, I attended a talk about Tasha Tudor and her garden given by Winslow Tudor, her grandson, in June. I’ve read all the books written about her and was looking forward to seeing the artifacts of her life, especially her collection of antique dresses, or frocks as she liked to call them. 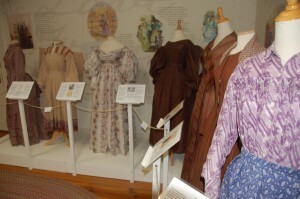 The exhibit “Frocks” goes until October 20th when the museum also closes for the season. Because I want to get this blog out as soon as possible so others will be aware that there are only a few weeks left to visit the museum, I won’t have all the book summaries completed. I’ll post the summaries as I complete them. 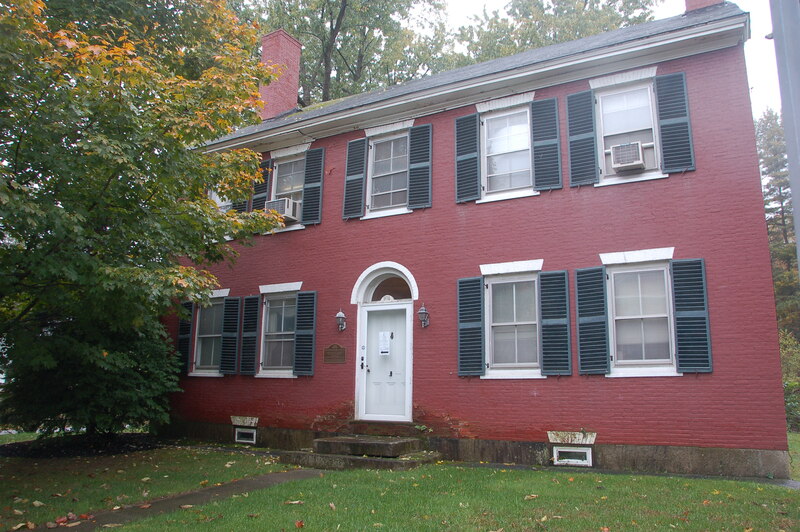 The museum is located in the Jeremiah Beal House on Western Avenue in West Brattleboro, which is owned by the Brattleboro Historical Society. The Beal House is a Federal Style brick building from the early 1800s and may have been a stop on the Underground Railway before the Civil War. 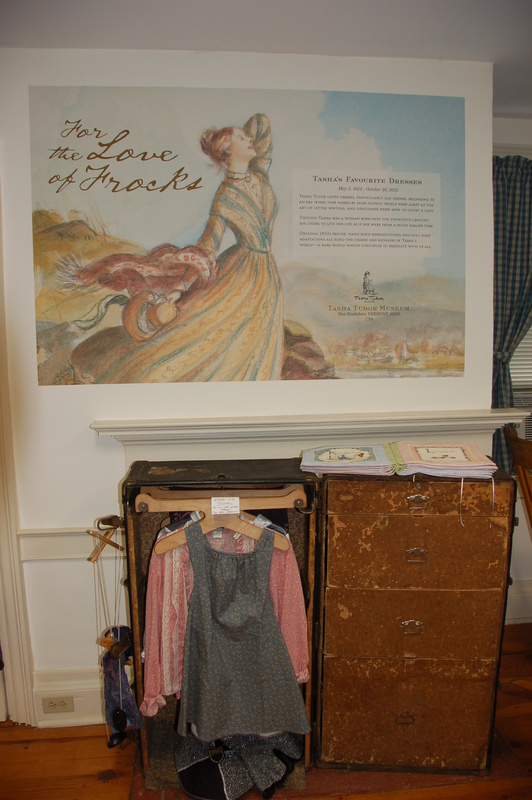 The Tasha Tudor museum occupies just two rooms on the second floor of the Beal House. Opened in 2009, this is their third season as a museum. Leigh Branson, the museum’s curator, warmly greets you as you enter and will answer any questions that you may have. I asked Leigh why they were in such a small space. She said that they wanted to start small, especially since the recession was well underway when they opened in 2009, and they wanted to learn about the policies and procedures necessary to run a museum effectively on a small scale first before taking on a larger space. The museum has been well received since it opened and has many supporters. So in time, they will move to a larger space and perhaps be able to offer classes as well as display more of Tasha’s items from her work and her home. 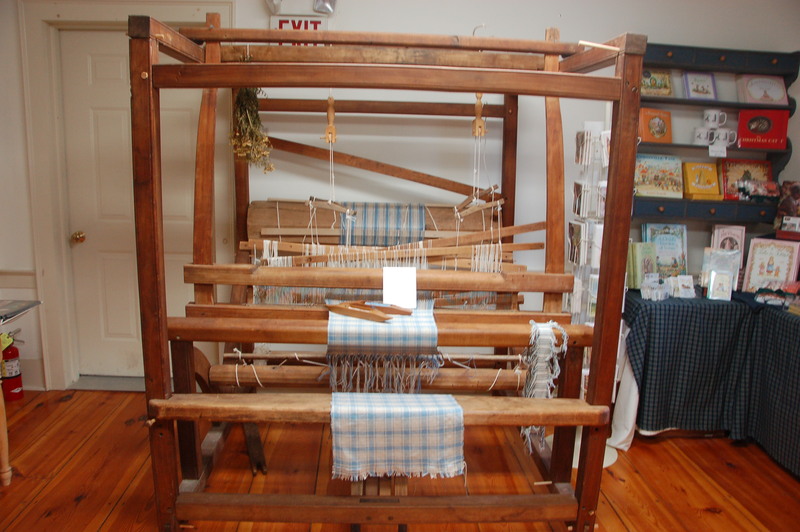 The first room that you enter is dominated by an early 19th century counter-balance loom on which Tasha wove many fabrics in between cooking and doing other chores. 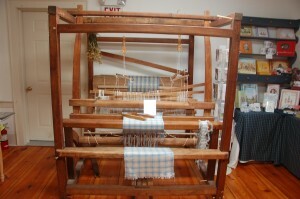 Occasionally, there is someone who can demonstrate how the loom works. There’s also a display in the corner of cards, illustrations, soaps, and other items for sale. 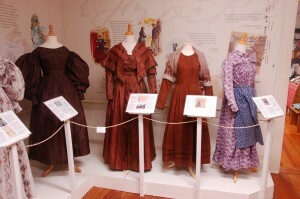 In the next room is the current exhibit of Tasha’s antique dresses or frocks. The exhibit includes seven of the many antique dresses that Tasha owned. 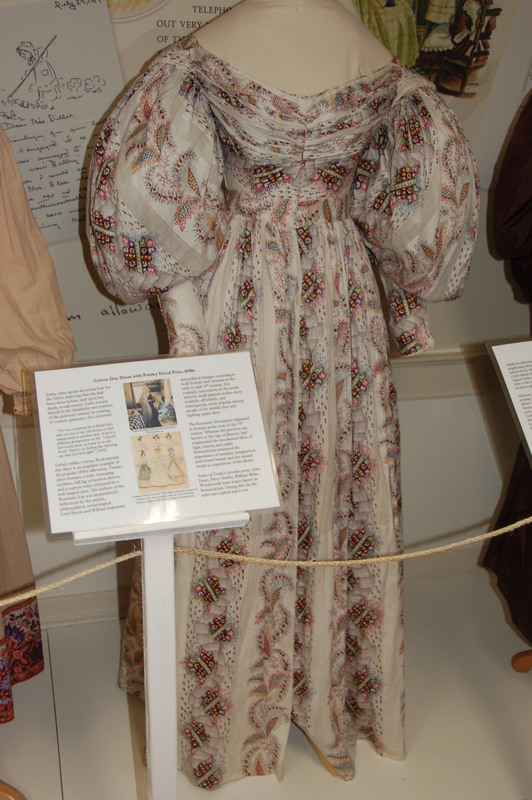 Her dress collection had been on loan to Colonial Williamsburg and most of this collection was auctioned off in 2007; Tasha bequeathed several of her favorites to her family who have loaned them to the museum for the exhibit. 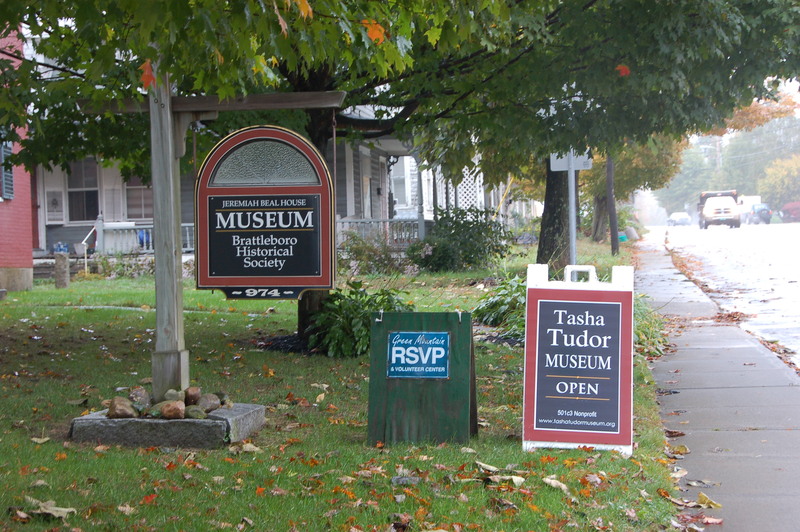 As you may know, Tasha was enamored with the 1830′s and 1840′s and how people lived then. It was a simpler time in that there was far less technology than we’re used to now. But it also entailed a great deal of arduous work without benefit of electricity and running water. Tasha emulated this lifestyle – raising farm animals, growing vegetables and flowers, making her own clothes – while raising her four children in a 19th century farmhouse in New Hampshire. However, Tasha didn’t look at this way of living as arduous; she loved the time period, known as the Romantic Era, that spoke to her soul and spirit. Tasha loved to wear her antique dresses, which she started collecting at the age of nine, as they made her feel feminine and part of this time period. Collectors would frown upon her wearing the antique dresses, but Tasha felt they were there to be enjoyed and wore them often. She also made her own dresses from that time period. She had the gift of being able to see a picture of a dress and to work out a pattern from which she could make the dress, sewing it by hand and with an antique treadle sewing machine. Her vast knowledge of historic clothing gave her the confidence to add her own creative touches to her dresses and other items. 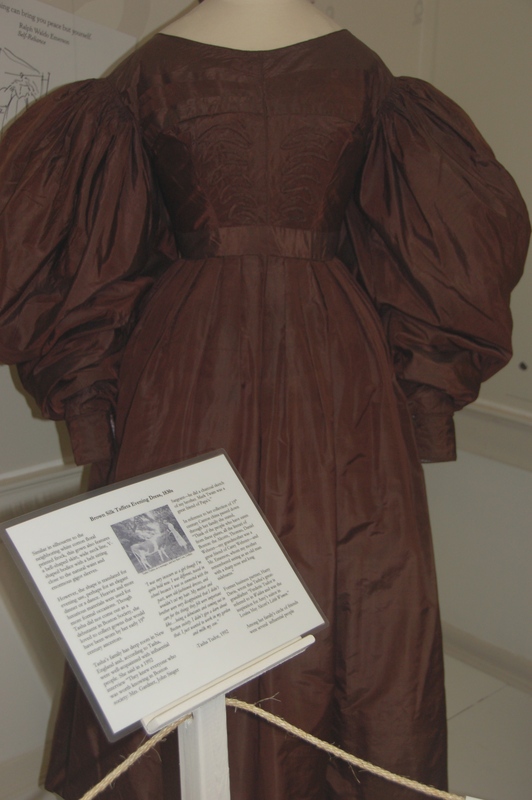 One of the dresses that she made was an 1870′s purple bustle dress with details such as piping, a watch pocket, and a bustle back. She used the sewing machine to put together the main pieces and then hand-stitched the detailing in the front. 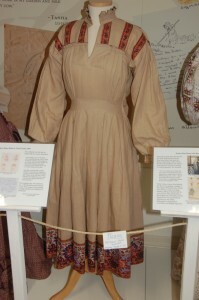 Next to it was a Pierre Deux dress in a tan cotton fabric that Tasha made in 1984. Pierre Deux was a luxury textile and decor company that specialized in French Country style. Tasha met the owner Pierre Moulin, who subsequently had her make sample dresses for a possible collection to market and sell. She made the samples but the project never went further. He did use the samples for a window display in connection with the Steven Sondheim play Sunday in the Park with George. Contrasting with the simple Pierre Deux dress was an 1830′s antique dress next to it – a paisley floral cotton day dress. This dress reflected the Romantic Era fashion at the time with a wide swooping neckline, large mutton sleeves, a narrow waist, and a bell-shaped skirt. Very feminine and in remarkably good condition. The formal brown silk gown was followed by Tasha’s favorite dress – an 1840′s silk pink and bronze striped dress with tassels and a silk pelerine, or cape. On the inside of the pelerine, Tasha found a tag that showed it had been displayed in the 1911 Scottish Exhibition of Natural History, Art, and Industry as a wedding dress. In contrast to the formal wedding dress, an 1840′s wool dress that Tasha wore in autumn and winter followed. You can see it the book Tasha Tudor’s Garden. It had brown, red, and blue striping with hemline pleats, popular at that time. She paired it with a wool shawl, a neck kerchief, half apron, and layers of petticoats, and wool stockings. Even though it was rare, she wore it daily. 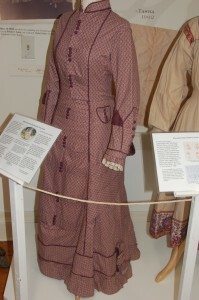 The last dress was a purple cotton frock with a floating panel on the back that Tasha copied from an 1880′s original. You can see this dress in the documentary Take Joy: the Magical World of Tasha Tudor. 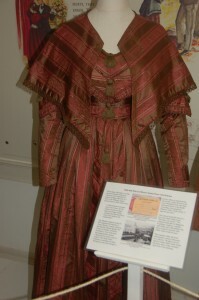 Prior to this dress, Tasha wore her “Stillwater” dress. Stillwater was her imagined New England religious sect that promotes the idea of a peaceful life filled with joy. The Stillwater dress designed and made Tasha had a gathered skirt attached to a fitted button down bodice with tapered sleeves. You can see her wearing it in the book Tasha Tudor’s Garden. She would wear these dresses until they were practically rags, so it is hard to find an original. Leigh said that they want children to feel welcome at the museum and have things that they are allowed to touch. So there are some toys, dolls, and marionettes as well as a trunk of dress up clothes for children to enjoy, allowing the adults with them time to take in the exhibit as well as Tasha Tudor books and merchandise. I highly recommend a visit to this exhibit. It’s one thing to read about her dresses, it’s quite another to actually see the dresses and more fully understand and appreciate Tasha’s love for the time period from which they came. I think the museum will expand in the next several years as support for their mission grows. A larger space will allow them to display more of the items from Tasha’s life and perhaps offer classes in the skills that Tasha used daily, such as weaving and cooking. In the meantime, the museum will continue to feature exhibits. The next one may be about the dolls Tasha created. 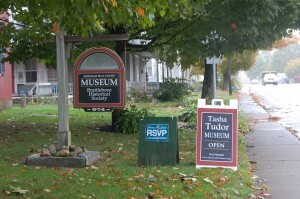 Tours of Tasha’s house in Marlboro, Vermont are offered in the summer. These are very popular and tickets sell out fast. Start looking in February of a list of tours. See the websites www.tashatudormuseum.org/ and www.tashatudorandfamily.com/ for more information. Loved your article – wished I had made it to the museum this summer – maybe next year. Also looking forward to my next newsletter. I hope to get to the wonderful looking museum someday! I am a huge fan of Tasha Tudor and one of the biggest disappointments in my life is missing out on the auction of some of her priceless pieces of clothing a few years back. Just a hankie or tiny piece of fabric that she had handled would be a dream come true. If I had it to do over, I would beg, borrow whatever it took to afford one piece. Ahhhh, dream on……. Earlier I have read that the museum can be open by appointment during the off-season. Is this a possibility? I will be in New England for most of November and was hoping to try and come to see it. At the end of September my husband, 17 year old son and I drove to Vermont for the Tasha Tudor Home Tour. We went to the Museum first and really enjoyed the exhibits, and I especially loved the “frocks.” In the afternoon we toured Tasha’s home. We all loved it! It was such a thrill- like stepping back in time for a couple of hours. I highly recommend both the Tasha Tudor Museum and the tour of her home. ..I love Tasha..she has been a mentor for years…What a wonderfully talented woman…love her philosophy and way of life….Her creativity…love of animals….Thanks to all that continue her traditions and share them with us. TAKE JOY! Thanks so much for the article. Dream of one day being able to visit the museum and Tasha’s home. It was wonderful how she inspired people by her simple life to examine their life for what was important to them.